So, I recently gave up cable. Along with saving me about 30 bucks a month, this move has allowed me to really start discovering some shows I never knew existed. One of them has been RuPaul’s Drag Race. Think Project Runway with drag queens, lip-sinking and a lot of adult humor. Anyway, I love the show and I just finished Season 4. One of the challenges was post-apocalyptic fashions and I was watching it while I wrote up this blog post. I will confess I tend to fast forward the show through the drama parts and mostly watch the runways for the fantastic outfits. This is also what I tend to do with Project Runway. Clearly, I’m just in it for the clothing. 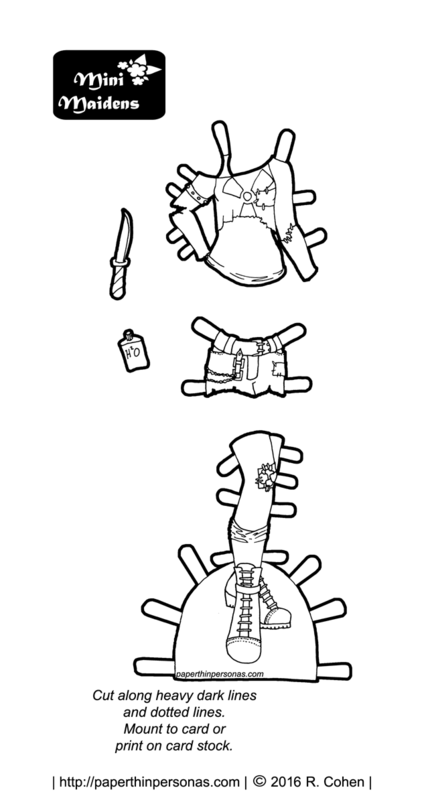 In Season 4, which I just finished, there was a post-apocalyptic fashion challenge and that inspired me to create this paper doll outfit. Meanwhile, the Mini-Maiden paper dolls are getting ready for the end of the world in style. Isadora has already gotten an End of the World set, but I think Hazel, Faye and Greta should have some options, too. Of course, any of the paper dolls from the Mini-Maiden series can wear today’s outfit. Mad Max is also a major influence on anything I create that is post apocalyptic. I mean, how can it not be? I thought I was the only one that did that! I record a bunch of fashion design shows and then fast forward through all the drama. I do watch the concepts though, mostly because I love seeing things evolve from first concept to final product. I also like watching reruns from 2-3 years ago, watching a designer get booted fro a “terrible” design, then seeing people today wearing pretty much the same outfit that was called terrible 3 years ago. I find it kinda funny. I love the outfit. It fits Mad Max very well. But that shirt I’d add to my own wardrobe. mad max is a designer’s dream–the whole kit and caboodle! i’m not particularly a fan of the post-ap aesthetic, but it certainly can be done well. this is fun! what is that one her belt? it almost looks like a fountain pen!